He is a fictional figure and a magistrate of Satsuma domain who is in charge of collecting sugar as land tax in Amami Oshima. He is described as a Jack in office in this series. He levies a tax severely and punishes a child called Také who tastes a piece of sugar. 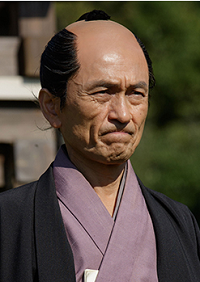 It antagonises the people of the island but SAIGŌ Kichinosuke, alias KIKUCHI Gengo who is exiled to there arbitrates the dispute. Then Kichinosuke asks Aikana (Tuma) why Yūnosuke collects the tax so severely. She answers the islands should make more sugar and pay them as tax because former lord SHIMAZU Nariakira wasted money to modernise Satsuma domain. It shocks Kichinosuke who is strongly influenced by him. Needless to say, Yūnosuke who serves the domain as middle manager is told to collect more sugar by his superiors. However, he oppresses more and more and entraps RYŪ Samin and Tomiken. They are imprisoned and Aikana tries to release them. Kichinosuke also goes there and tries to persuades him but he doesn't listen to what he says. Then he breaks the lock of the jail with a sickle Aikana brings. Yūnosuke is angry with it and plans to write about it to his superiors. 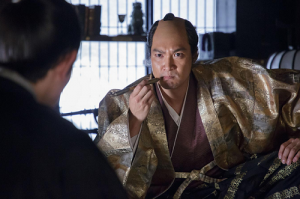 But he stops doing so as KOBA Dennai brings him a letter of Ōkubo Shōsuke (later Ichizō) and learns the real identity of Gengo is Saigō Kichinosuke from it. Gesshō was a priest at the end of Edo period. He was known for his activity as royalist and the friendship with SAIGŌ Kichinocuke. He was born as son of a physician of Osaka but became a priest in 1827. In 1835, he became a chief priest of Jōjuin of Kiyomizu-dera Temple. 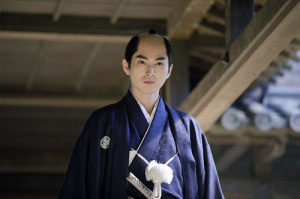 But he interacted with people who supported royalism (sonnō-ha) and took part in the group that recommended HITOTSUBASHI Yoshinobu for the 14th shogun and opposed II Naosuke. After II Naosuke became Tairō, he and Kichinosuke were pursued by Naosuke's men and arrived in Satsuma after a lot of hardships. He was sheltered in a house of Kichinosuke but he was told to go to Hyūga (current Miyazaki) at last. It meant that he would be executed so he and Kichinosuke threw themselves into the water. Though Kichinosuke survived, he was drowned. He is said to have advised Kichinosuke not to die when he tried to commit suicide for SHIMAZU Nariakira who died suddenly in 1858. In this series, he is a priest who is a close friend of KONOE Tadahiro and became to know Kichinosuke at his residence. After II Naosuke took office, he travels to Satsuma with Kichinosuke and ARIMURA Shunsai (later KAIEDA Takeji) eluding the authorities. 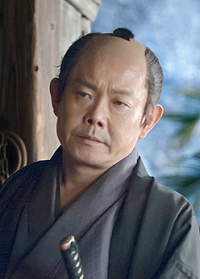 The image showa ONOE Kikunosuke as Gesshō. On a charge of disobeying Hisamitsu's order, Kichinosuke is exiled to Tokunoshima and MURATA Shinpachi is exiled to Kikaijima island. As both of them are criminals, they cannot receive stipend and should be self-sufficient. Then ŌKUBO Ichizo sends Kichinosuke a letter saying that Japan needs to change Japan Kichinosuke will be recalled to Satsuma soon. And Aikana visits him with Kikujirō, a baby daughter and elder brother Tomiken. Kichinosuke meets his daughter for the first time and names her Kikusō. A little while ago, Aikana asked her uncle Samin to go to Tokunishima but was not allowed because her time was near. But Tomiken offered his help. Soon after she gave birth to a girl (Kikusō) and then she visits her husband in Tokunoshima. Kichinosuke thanks to Tomiken who sleeps in his hut but he is awake in reality and delighted with his words. Aikana knows about the Teradaya Incident also. 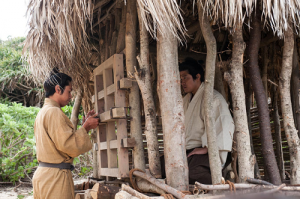 Though they plan to live together in Tokunoshima, the officials of Satsuma domain visit the hut and take him along as it is decided that he is exiled to Okinorerabu Island. Aikana tries to protest them but Kichinosuke tell her not to make matters worse. He says farewell to Aikana, Kikujirō, Kikusō and Tomiken and goes to another place of exile. The island situates farthest south in the territory of Satsuma domain and the place where only felons are exiled. Meanwhile, SHIMAZU Hisamitsu whose appeal was accepted by the Imperial Court goes to Edo. TOKUGAWA Iemochi, the 14th shogun is obliged to obey the order of the court backed by Hisamitsu who neither has official rank nor official title. It is an unprecedented event since the establishment of the Tokugawa shogunate. Thus HITOTSUBASHI Yoshinobu and MATSUDAIRA Shungaku (Yoshinaga), both of whom were made to confine themselves at home by II Naosuke take office again. However Yoshinobu says what Hisamitsu does is nothing but imitating what his dead brother Nariakira planned in front of Hisamitsu himself and he doesn't understand how Japan should be. Then he tells him who uses Satsuma dialect to speak in ordinary language. He says ironically that it's hard for him to understand what he says and calls him "bumpkin" (**). Yoshinobu asks him whether the ox man comes to Edo or not. Though Hisamitsu doesn't understand what he means, Ichizo realises that he means Kichinosuke. Yoshinobu tells Hisamitsu that he should bring Saigō if he hopes to talk with him and he thinks he is alive in reality. Hisamitsu loses face by his words. And Kichinocuke arrives at Okinoerabu Island and is imprisoned in an outdoor jail and TSUCHIMOCHI Masateru, official of the island and lived in Satsuma before greets him with his mother Tsuru and some islanders. They share their food with him so he can have usual cuisine. One day Masateru brings him two letters but somebody snatches them from him. 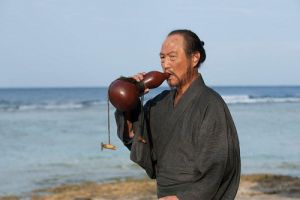 He is called KAWAGUCHI Seppō who has spent ten years in the island as exile and drinks sake from a gourd in the broad daylight. He opens the letters without the permission of Kichinosuke and begins reading. Both of them are from KAIEDA Takeji and ŌYAMA Kakunosuke and complain importunately that Ichizō tries to curry favour with Hisamitsu. Kichinosuke says to himself that they cannot understand what Ichizō really thinks but Seppō asks him whether he really understands him or not. Kichinosuke answers that he does because Ichizō is his friend but Seppō then asks him why his friend didn't oppose his exile and leaves him in such condition. Seppō insists that there is nobody who doesn't betray others and reveals that Masateru brings him food with sympathy to him who is to be executed someday. In actuality, the food for a criminal is cold barley-rice and salt that is served once a day. After that, Kichinosuke doesn't have the food brought by Masateru. He gives it to children and lives on barley rice and salt only. Masateru persuades him to have the usual cuisine but he never listens to him and becomes to grow haggard. One stormy night, Kichinosuke cannot move any more and the jail is hit by rain and wind. The memories of Ichizō and Aikana cross his mind and he hears his own voice speaks to himself. "You have more things to protect." "There are more things only you can do." At the same time, Aikana prays for the safety of her husband in Amami Oshima. 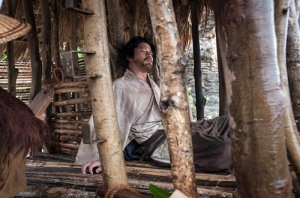 After the storm, Seppō finds Kichinosuke lying in the jail so he breaks a bar and make him drink the water from his bamboo container but in vain. Then he makes him swallow it from his mouth and sees his throat moves. Later Masateru and islanders visit and enter the jail and recognises that he is alive. They take him to the house of Masateru to keep him alive, even though it's against Hisamitsu's order. (*) He has kiseru, smoke tube in the right hand. (**) In Japanese, he says "imo" that originally means potato but also means bumpkin or unsophisticated people. 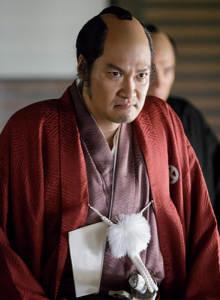 He is a fictional figure but maybe based on YAMADA Tamemasa who served SHIMAZU Nariakira closely. In this series, he is described as a man who is a little and cautious man. He is a typical loyal vassal who is faithful to his lord. But sometimes he cannot understand what he intends to do. And he is perplexed by SAIGŌ Kichinosuke also as he often behaves recklessly. He warns him several times but became familiar with him. When Nariakira tries to have his photograph taken, he who is with him is finally made to sit for photograph instead. 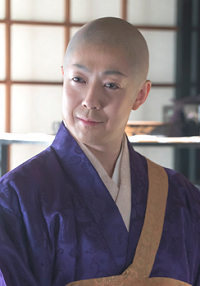 The image shows Yū Tokui as Yamada Tamehisa.